Pure blue diamonds are some of the rarest diamonds in the world. 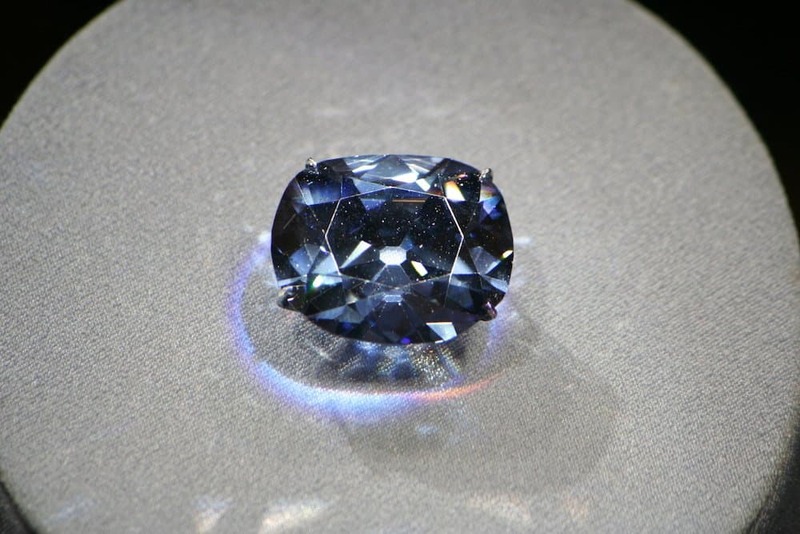 If you have any interest at all in diamonds, which you probably do since you’re here, you’ll have heard of the Hope Diamond. It’s one of the largest diamonds in the world while not even being pure blue. The diamond is considered a Fancy Dark grayish blue. 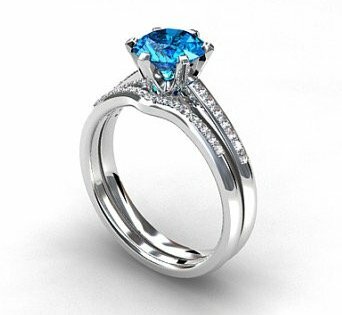 In many cases, a pure blue diamond will be out of your budget unless you choose one with a secondary color, or one that has been treated to give it a darker hue. When a diamond is being formed underground, it can have a reaction to the minerals or gas nearby. They absorb a certain color of light based on the minerals or particles and the opposite color is reflected. In blue diamonds, boron particles are trapped in the crystal lattice of the diamond. It absorbs yellow light and reflects a blue light. One of the biggest sources of blue diamonds on Earth is the Cullinan Mine in South Africa, and there is even a diamond mine tour of this particular mine if you’re interested. It’s found the most interesting blue diamonds in the world, including a 29.6 carat rough, Vivid blue diamond that was polished to 12 carats. The flawless blue diamond was named the Blue Moon. The limited supply of colored diamonds is what makes them so valuable. 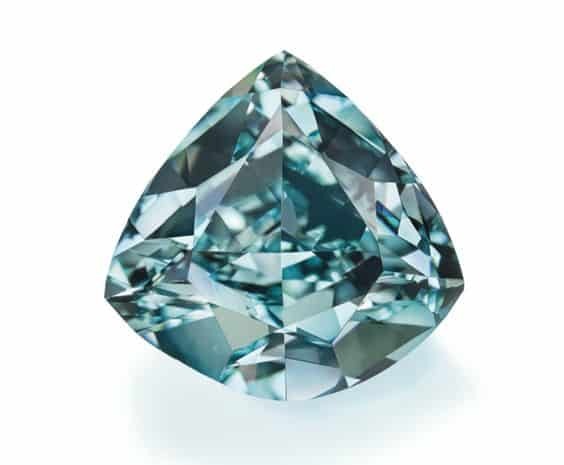 Like other colored diamonds, grading a blue diamond involves grading the saturation of the color. Faint or Very Light blue diamonds are less expensive than those that are Fancy Vivid blue. The grading starts from Faint, Very Light, Light as the bottom of the price range, yet they’re still quite expensive for diamonds since the color is so rare. Once they get into the Fancy range, they increase out of most people’s budgets. Fancy includes Fancy Light, Fancy, Fancy Dark, Fancy Deep, Fancy Intense and Fancy Vivid. The hue of the diamond has an impact on the price too. In other diamond colors, the hue of the diamond can decrease the value depending on the rarity of the secondary color. 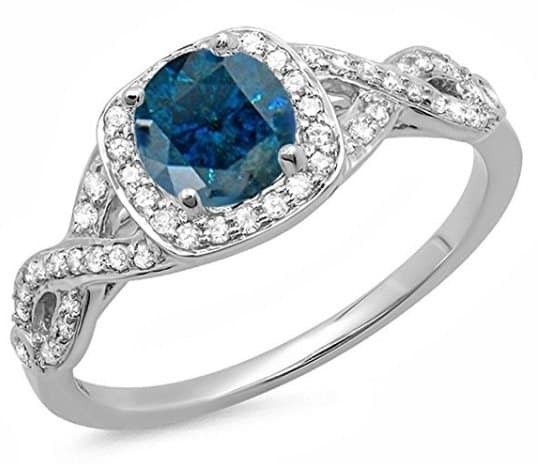 In the case of blue diamonds, there isn’t a color that will decrease the value by very much. The Hope Diamond has a hue of gray in it, and is still worth millions. These tiny loose teal green blue diamonds hold their value even with the many other hues in them. 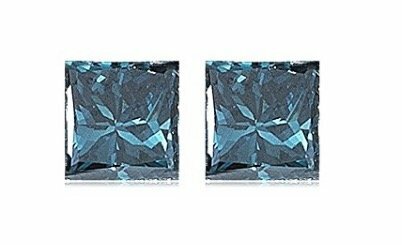 While the secondary color won’t decrease the value of a blue diamond by much, treating the diamond to enhance the color will. 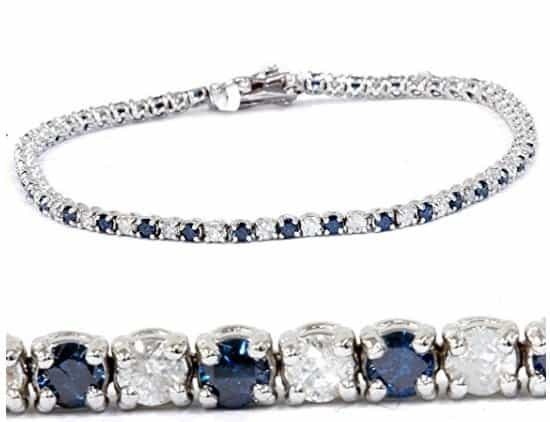 It’s how blue diamond lovers are able to afford beautiful pieces of jewelry with stunning blue diamonds in them. Diamonds are enhanced using high pressure heat to increase the depth of the color in the diamonds. They might also be irradiated to saturate the diamond with a deeper color. There are some stunning diamond jewelry that owe their color to enhanced diamonds. Every color of fancy diamonds is incredibly unique. While white diamonds are judged and priced based on certain characteristics like clarity and size of diamond, colored diamonds have more nebulous characteristics like hue and saturation, which can appeal to different collectors and jewelry lovers. For example, one person might like a Faint blue diamond in a simple setting while another wants a deep, saturated diamond of Vivid blue. They might be the same size, but valued very differently. According to GIA, which is the Gemological Institute of America, the U.S. Federal Trade Commission requires gem dealers to produce paperwork that details if the gem was mined, treated, natural or synthetically produced. This is to avoid customers paying too much for synthetic or treated diamonds. There are ways to purchase a blue diamond that is within your budget without resorting to treated or enhanced diamonds. Choose a diamond with a secondary color. While it won’t have a huge impact on the price of a blue diamond, since they’re so rare, you will get a bit of a savings if you choose a grayish blue or greenish blue diamond opposed to a Fancy Vivid pure blue one. Flaws and inclusions can be a good thing. You’ll be able to get a diamond with low clarity, yet nobody will know unless you show them. A small flaw can really knock down the price of a colored diamond without sacrificing visual quality. Who is going to look at your beautiful blue diamond under a microscope when you show it to them? A round-colored diamond can be more expensive than a square-cushion cut. An oval shape can also decrease the price of the colored diamond. A beautiful Fancy Vivid oval cut can equal the price of a round Light blue diamond. When choosing a blue diamond, you’ll have to decide whether you want a treated diamond for its more saturated color or a pure diamond that is graded lighter. All these decisions can impact the price of these rare colored diamonds.